On Oct. 28, NASA’s twin Radiation Belt Storm Probes (RBSP) completed their 60-day commissioning phase, and began their two-year primary science mission to explore our planet’s radiation belts, named for their discoverer, James Van Allen. The commissioning phase, which began just after RBSP’s launch on Aug. 30 from Cape Canaveral Air Force Station, is a standard period during which spacecraft systems are deployed and certified, and instruments are powered up and readied for normal science gathering operations. Each RBSP spacecraft carries an identical set of five instrument suites that will allow scientists to gather data on the charged particles, fields and waves of the Van Allen radiation belts with unprecedented detail. Earth’s radiation belts can respond in unexpected ways, often quite suddenly and dramatically swelling and shrinking in response to dynamic changes in the sun. In 1958, the team led by University of Iowa professor (and former APL staffer) James A. Van Allen, using observations from Explorer 1 (the first American satellite), made the surprising discovery that intense radiation – highly-energized charged particles that can damage spacecraft and harm astronauts – is trapped by our planet’s magnetic field. Later space missions revealed that the radiation occurs in two swaths around Earth. The inner, relatively stable belt, composed mainly of protons, extends from the top of the atmosphere out to an altitude of some 4,000 miles. The outer belt, composed mainly of high-energy, fast moving electrons, extends from about 8,000 miles to more than 26,000 miles above Earth’s surface. 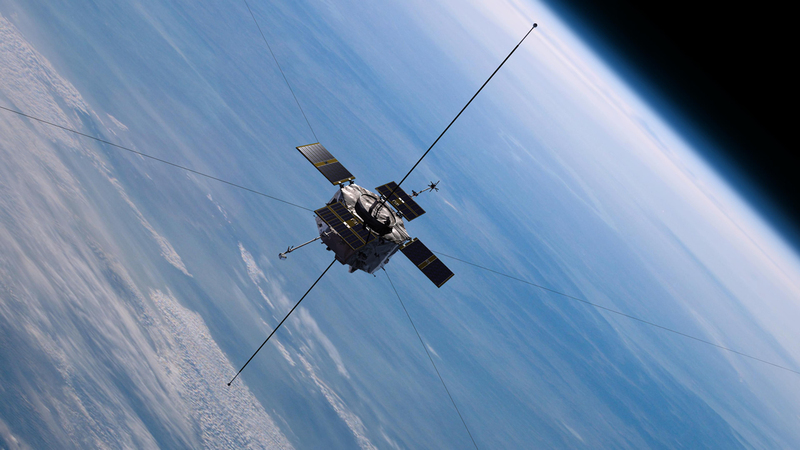 To explore these hazardous regions of space, the two sun-pointing RBSP spacecraft will fly in nearly identical eccentric orbits that cover the entire radiation belt region. The spacecraft orbits will reach maximum altitudes between 18,672 mi. and 19,417 mi., and minimum altitudes between 311 mi. and 419 mi. Learn more about RBSP’s instrument suites by visiting here and in the RBSP press kit (PDF), available here.